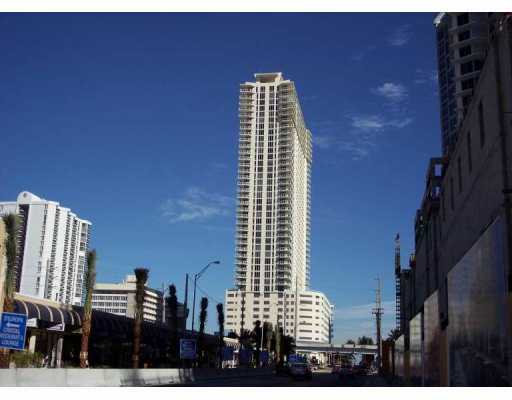 La Perla Condominium located in exclusive Sunny Isles Beach was a Kobi Karp project. The property is 43 stories high and includes 326 residences of studio to two bed configurations from 1,037 square feet to 2,053 square feet, respectively. It stunning views of the Atlantic Ocean and excellent location make it one of the premier residential buildings in Sunny Isles. Each La Perla residence offers an exclusive standard of living with stunning views of the Atlantic Ocean, bay, and city. The property is designed in an oceanfront park style with fountains, park, and landscaped deck facing the ocean. Resort and convenience amenities include children’s play area, business center and conference room, 24 hour valet and front desk, sports lounge, billiard room, excents space, and state of the art fitness center and spa. Residence amenities include panoramic views, imported Italian cabinetry, granite countertops, GE appliances, Kohler fixtures, marble and tile flooring, and floor to ceiling tinted windows. These residences and features satisfy even the most discriminating tastes. La Perla condo in Sunny Isles also provides access to an incredible beachfront spa for your enjoyment, a cardio center to help you stay fit and healthy and much more, as well. A sports lounge offers you big screen sports excitement and a full bar, while the kids' playroom will help your entire family have fun. A billiard room is the perfect place for a little fun gaming, while the nearby restaurant can provide some room services for your enjoyment. Sunny Isles Beach was initially developed as a tourist destination in 1920 and with the access to Miami Beach with the Haulover Beach, its’ designation was secured. It continues to be a developer favorite and has recently largely been developed by giants such as Micheal Deezer and Donald Trump. Its’ white sand beaches and gourmet and casual dining, make it the perfect beach town. Neighboring Sunny Isles Beach to the north is Aventura and to the South is Bal Harbour, which is one of the premier shopping and dining destinations in South Florida. The international airports of Miami and Fort Lauderdale are within 30 minutes. La Perla offers an elite lifestyle within an idyllic beach town.